More Power - for "bigger sound" with more body and authority, increased dynamics and volume, and more extended frequency range. MusicCord increases transient current flow. Power Conditioning - for improved clarity, tone and resolution. MusicCord filters phase distortions to alleviate grain, harsh transients and muddy bass. Soundstage imaging and spatial qualities are enhanced. 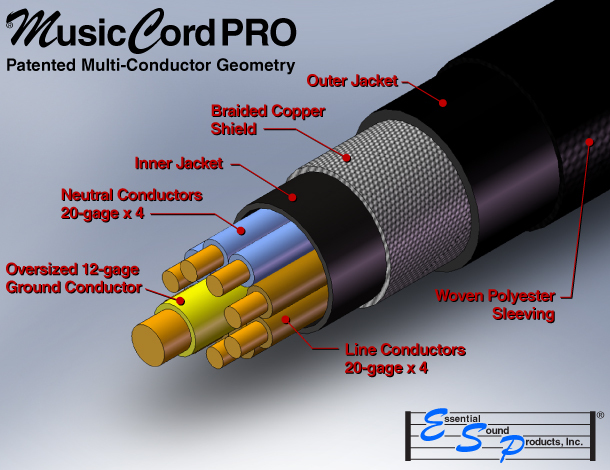 MusicCord's patented cable geometry with maximum coverage braided copper shield lowers the noise floor. Read how stock power cords contribute to sound quality and noise isses you may be experiencing and how MusicCord provides a complete power solution for your audio system. Can Sometimes Pick Up Radio Stations! 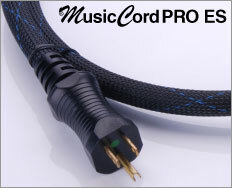 MusicCord's maximum-coverage braided copper shield & spiraled conductors reject RFI, contain EMI. Stock Power Cords, A Current "Bottle Neck"
These sound quality issues can usually be traced to the component power supply not getting enough current to operate properly. The 18-guage power cord supplied with most audio gear acts as a "bottle neck", restricting current flow. Switching to a 14-gauge power cord introduces more phase distortions, exacerbating conditions like sluggish bass response, blurred imaging and high-frequency roll-off. Neither power cord provides an optimal solution. MusicCord’s patented cable geometry dramatically improves transient current flow while filtering phase distortions to provide greater bass extension and tighter control, a richer tonal palette with harmonics intact, and elimination of midrange harshness during transients and loud passages. The midrange becomes smoother and more pleasing. Ear fatigue is eliminated. Once midrange harshness is reduced, volume can be increased to make it easier to understand dialog and vocals. All these improvements are appreciated against a quiet background because of our shielded cable construction and attention to detail in the termination process. More than any other audio cable manufacturer, Essential Sound Products has strived to back up our claims with audio samples and demonstrations, and test and measurement data, and to share this information with you, our customers. For more details, please visit ourpower cable technology web page. It only takes a loose connection to have a buzz noise in your system. Cheap power cords are notorious for loose crimp joints. Their molded connector body provides minimal strain relief. Just a tug on the cable instead of grabbing the connector body to detach the power cord can loosen conductor terminations and cause a buzz noise. These cheap power cables typically have weak, easily deformed folded metal contacts that may not consistently make good contact with the mating power inlet or outlet. Gaps between folded metal allows contamination and moisture, which promote corrosion and reduce conductivity. 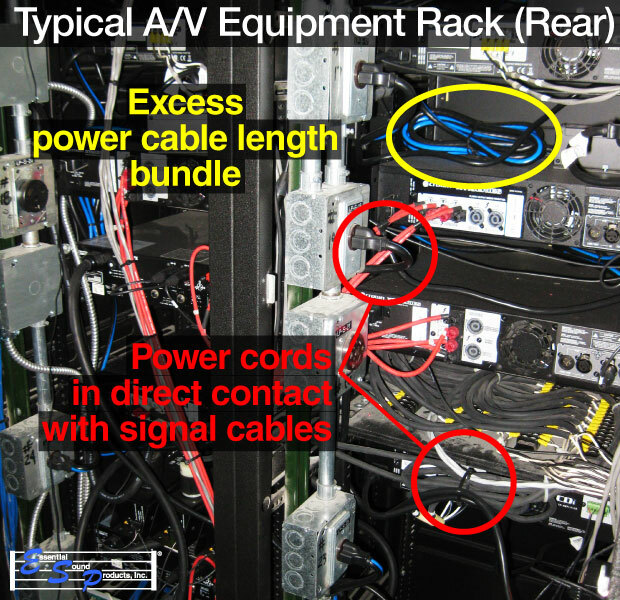 Audio/Video equipment racks present a particular noise challenge. Power cords for each component are intermixed with interconnects, speaker cables and control wiring. Excess power cable length exacerbates the problem of signal cables coming in close proximity and sometime contacting the power cables. Practically all power cables supplied with audio/video gear are unshielded. Unshielded power cords in this environment presents a potential noise problem for two reasons. Like unshielded signal cables, power cords are susceptible to RFI (Radio Frequency Interference). Numerous guitar and bass players have told us that when performing in venues with fluorescent lighting, they have experienced hum noise through the amplifier using their stock, unshielded power cord. Others have reported they have even picked up faint radio stations! These issues were eliminated when they switched to MusicCord! Unshielded power cords can actually cause hum noise in nearby signal cables. The strong magnetic field surrounds the power cable is a source of EMI (Electro-Magnetic Interference). A Mylar/foil shield found on some interconnects is ineffective at stopping magnetic field propagation. Best practice is to space signal cables away from power cords, but in most installations it is practically impossible to avoid some undesired routings. 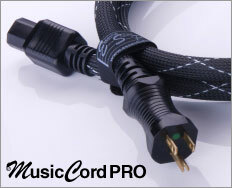 MusicCord unleashes the full performance potential of your audio system! 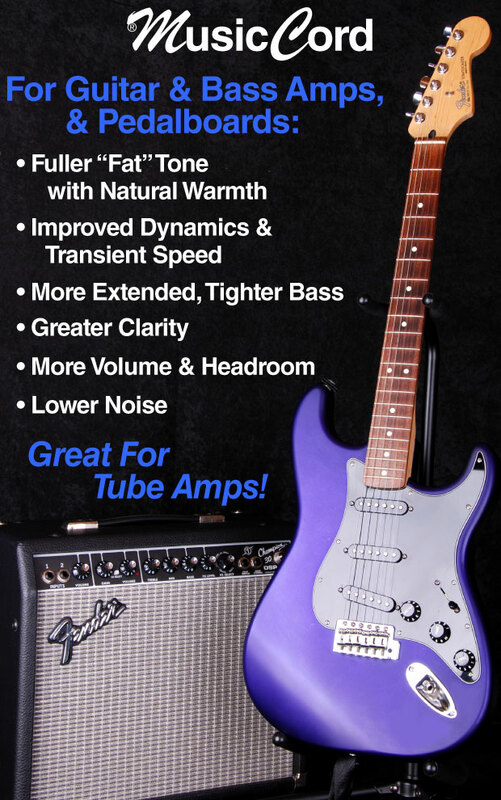 You’ll get “bigger sound” with increased dynamics and volume. And the bass will be more extended and tight! You’ll feel more like you just bought a new amplifier rather than replacing a power cord! The soundstage will expand in all directions with greater clarity and more resolution. Imaging is enhanced with more precise location of vocals and instruments. Your tone will be transformed from thin to "fat" with natural warmth and the full harmonic pallet now intact. The midrange will be smoother and fatigue free - more "analog" sounding digital! Integrated power conditioning addresses a problem that cannot be solved by typical conditioners – eliminating the inferior power cord! Moreover, the circuit’s electrical properties can be better optimized to more effectively reduce phase distortions and improve transient current flow. 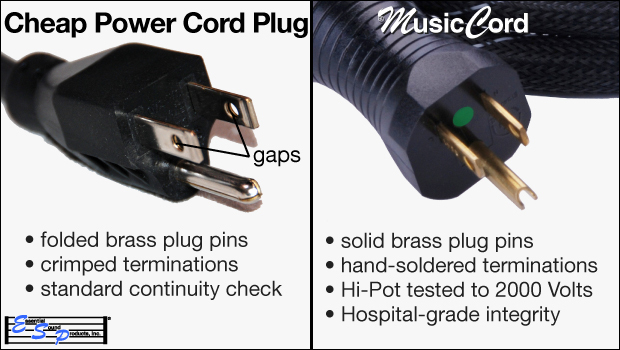 Compare the overall sound quality improvement afforded by MusicCord to a traditional power conditioner. Let your ears be the judge! How do we do it? MusicCord’s patented cable design features multiple line/neutral conductors spiraled around an oversized ground conductor and maximum-coverage braided copper shield. Most types of audio/video signal cables are available with shielding. You may wonder why shielded power cords are not standard with audio gear. Aside from added cost, there is a legitimate sound quality issue associated with most shielded power cords. Shielded power cords will cause distortion in the bass frequencies. The sheild exacerbates the second harmonic of the ac mains carrier frequency, which is 60Hz in North America (50Hz in most countries with 220/240-Volt ac mains). Therefore, you'll have a bass "bump" at 120Hz. MusicCord’s shield in is intentionally spaced away from the current-carrying conductors by an inner jacket to reduce potential interaction. This additional spacing combined with using multiple current carrying conductors where each has a weaker magnetic field than a single large conductor, dramatically reduces potential interaction. You get the benefits of the shield without the negative distortion effects. 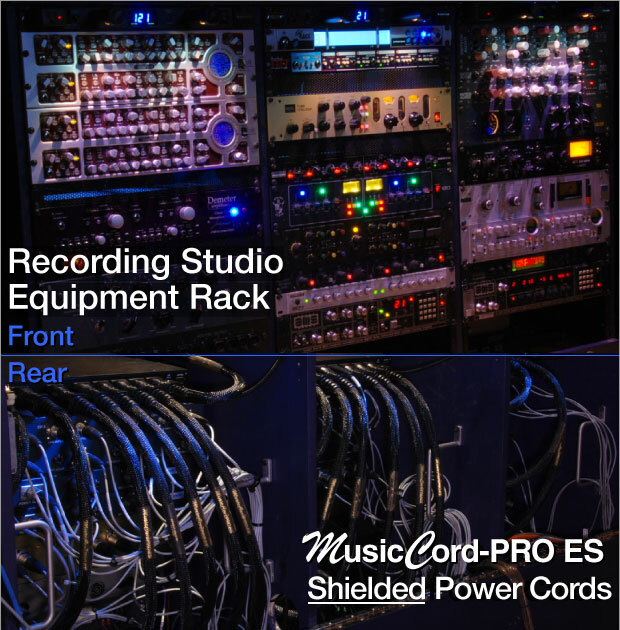 Below is a photo from a recording studio where shielded MusicCords replace the unshielded OEM power cords. First, you notice the shorter power cables, which eliminate excess length and make for a professional appearance. 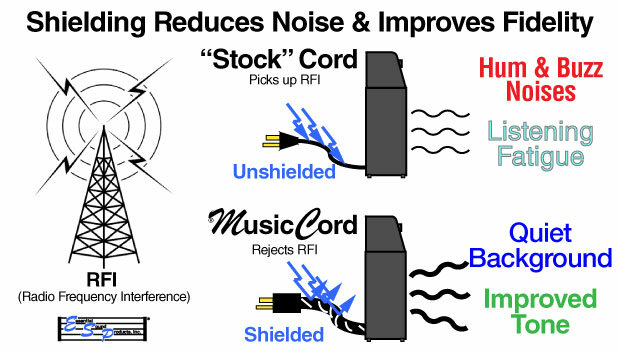 More important, MusicCord’s patented shielded cable design is effective at rejecting RFI and preventing EMI in the Cat-5/6 interconnect cabling. 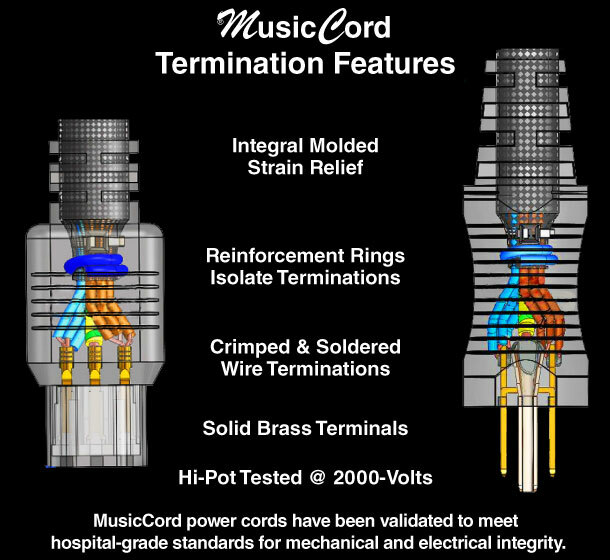 MusicCord conductors are hand-terminated to plug and connector pins. Each conductor is crimped, then hand-soldered to insure optimal electrical conductivity and mechanical integrity. To make the terminations further resistant to handling stresses, reinforcement rings are assembled to the cable ends, then over-molded. If the cable is tugged, the stress is on the reinforcement, not the terminations! 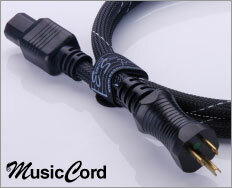 Each MusicCord is Hi-Pot tested at 2000-Volts to insure insulation integrity. That's 10-20 times greater than the ac mains voltage the power cord will experience in normal operation. This severe test will reveal any potential for short circuit. with your gear is Hi-Pot tested to 2000-Volts? Not! Power cords are the most overlooked part of the audio system. Many customers believe they need to replace the component to solve sound quality and noise issues. In many cases, buying a new component will not solve the problem. What is really needed is a power cable that has been designed and developed to address the unique requirements of audio/video gear in the environments they are used. What you need is MusicCord. 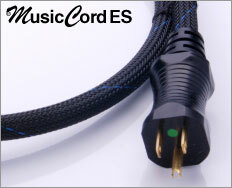 Investing in a MusicCord power cord represents a small fraction of the cost of purchasing a new component. 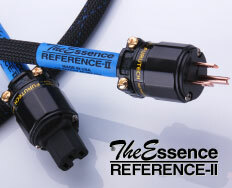 After more than 25-years’ experience and much research and development, Essential Sound Products has accrued a wealth of understanding why the power cord has such a profound impact upon audio component performance and how to optimize the design to improve sound quality in several key areas. We're so confident that if you try our high performance ac power cords that you'll be completely satisfied, we back them with a 30-day satisfaction guarantee and lifetime warranty. How can we make such a strong commitment to our customers? 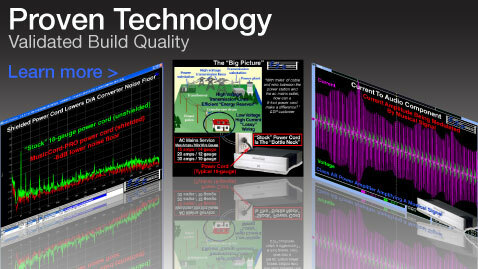 Learn more about our technology and build quality.